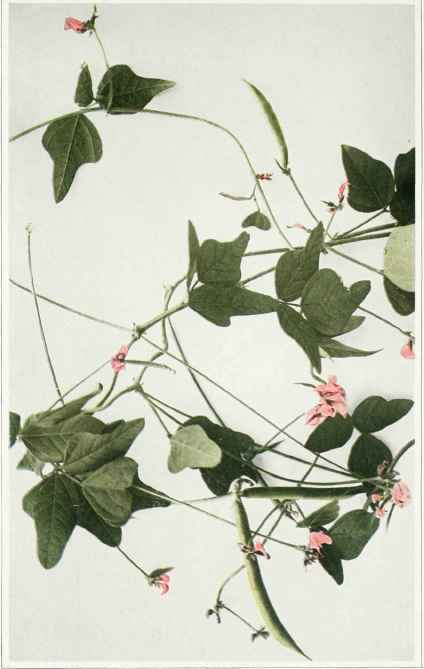 A twining or trailing and climbing, herbaceous, rough-pubescent vine. Stems more or less branched below, 2 to 7 feet long, or dwarfed and almost erect, from an annual root. Leaves pinnately three-foliolate; leaflets ovate, pointed or blunt at the apex, the base rounded, thickish in texture, usually bluntly lobed, 1 to 2 inches long, the two lower leaves unequal at the base. Flowers greenish purple, about one-half of an inch long, three to twelve together in dense, capitate clusters at the ends of long, axillary stalks which are longer than the leaves; keel of the corolla strongly curved and slender. Fruiting pod round in cross-section, somewhat hairy, linear and without a stalk, 1½ to 3 inches long. In sandy fields and thickets, mainly near the coast, Quebec to Massachusetts and Florida, less frequent westward through Ontario to South Dakota and Kansas. Flowering from the latter part of July to September and October. A closely related species of Long Island and southward, S. umbe1-lata (Muhlenberg) Britton, has shorter pods, slightly larger flowers, entire leaflets and perennial roots.